why textile manufacturers should hire women, 1888. Girls and women were essential to industrialization in Canada, particularly in the cotton textile industry, which was concentrated in Quebec. In 1891, for example, more than 2000 girls and women toiled in Quebec’s cotton mills, representing more than half the industry’s labour force in Quebec. Conventional wisdom would have it that young girls and women were most often quiescent workers who undercut unions’ organizing efforts. In fact, women cotton workers demonstrated remarkable levels of labour activism and militancy across time. these girls and women were instrumental in transforming Quebec, perceived to be a seemingly boundless source of cheap docile labour, into an increasingly urban and industrial society thus heralding the Quiet Revolution of the 1960s. 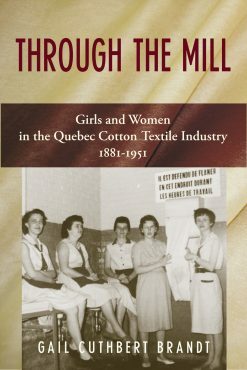 At the core of Through the Mill are 84 previously unpublished oral interviews with women born between 1895 and 1934 who worked in Quebec’s cotton textile mills. These working-class women are given a chance to talk freely and in their own words about all aspects of their lives and working conditions in the cotton mills. Gail Cuthbert Brandt also examines the companies’ motivation for employing girls and women, their recruitment methods, demographics, and gender divisions both at home and in the factory, with an eye on changing economic conditions, cultural and social attitudes, and technologies. Through the Mill is an invaluable contribution to feminist labour history and among a handful of studies to analyse the lives of women industrial workers in Canada. Gail Cuthbert Brandt is a specialist in Quebec history and Canadian women’s history. She is co-author of Canadian Women: A History (three editions) and of Feminist Politics on the Farm: Rural Catholic Women in Southern Quebec and Southwestern France. She holds a PhD in History from York University. She taught for 20 years at York University’s bilingual campus, Glendon College, and was named Principal of Renison University College at the University of Waterloo in 1992. A former president of the Canadian Historical Association, Dr. Cuthbert Brandt is also a founding member and former executive officer of the Ontario Women’s History Network and a member of the Canadian Committee on Women’s History. NOTE: For a complementary book that deals with the cotton textile industry the United States and migration from Quebec see A Distinct Alien Race, The Untold Story of Franco-Americans, Industrialization, Immigration, Religious Strife by David Vermette.